As energy sources and structural components, sugars are the central regulators of plant growth and development. In addition to the abundant natural sugars in plants, more than 50 different kinds of rare sugars exist in nature, several of which show distinct roles in plant growth and development. 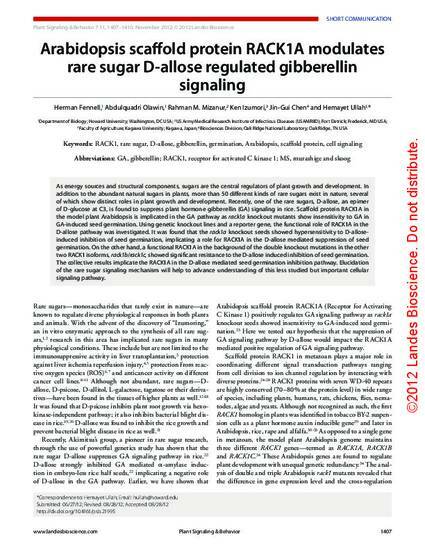 Recently, one of the rare sugars, D-allose, an epimer of D-glucose at C3, is found to suppress plant hormone gibberellin (GA) signaling in rice. Scaffold protein RACK1A in the model plant Arabidopsis is implicated in the GA pathway as rack1a knockout mutants show insensitivity to GA in GA-induced seed germination. Using genetic knockout lines and a reporter gene, the functional role of RACK1A in the D-allose pathway was investigated. It was found that the rack1a knockout seeds showed hypersensitivity to D-allose-induced inhibition of seed germination, implicating a role for RACK1A in the D-allose mediated suppression of seed germination. On the other hand, a functional RACK1A in the background of the double knockout mutations in the other two RACK1 isoforms, rack1b/rack1c, showed significant resistance to the D-allose induced inhibition of seed germination. The collective results implicate the RACK1A in the D-allose mediated seed germination inhibition pathway. Elucidation of the rare sugar signaling mechanism will help to advance understanding of this less studied but important cellular signaling pathway.